Snow globes can be such a nice gift to give at Christmas. 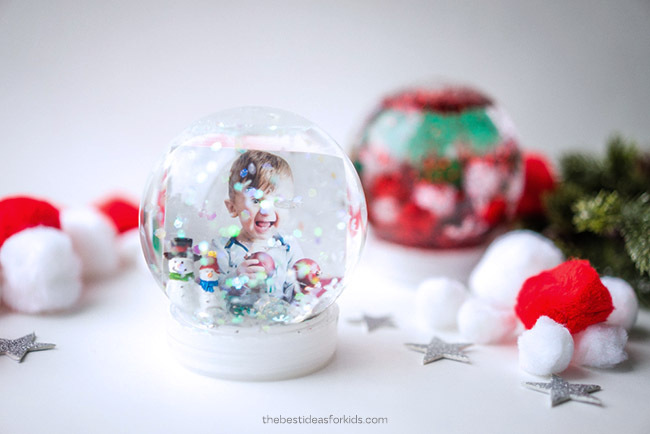 Kids love to watch the glitter swirl inside and they will love helping to make their own diy snow globe. 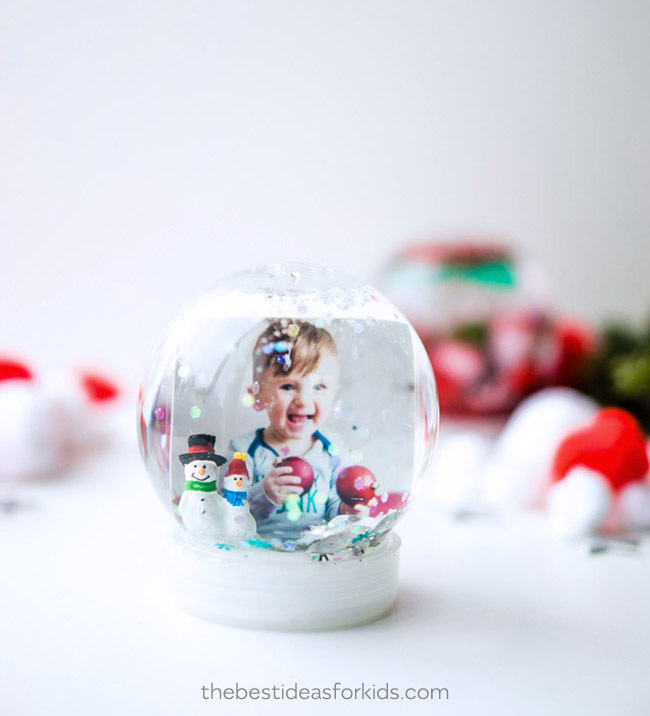 If you’ve been wondering how to make a snow globe on your own then this tutorial is for you. It’s actually a lot easier than you’d think and it doesn’t take too long to put together. 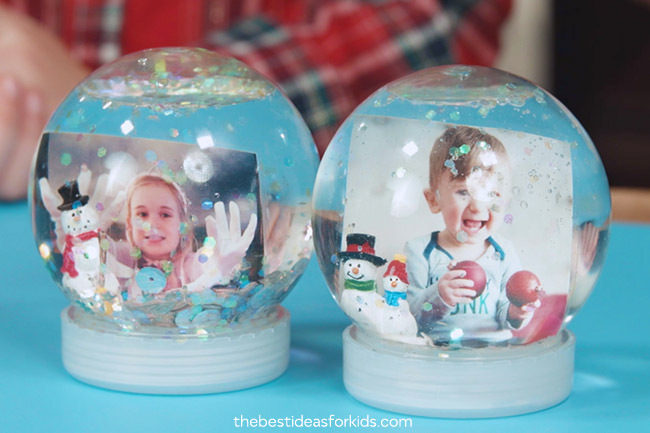 We hope you enjoy making this homemade snow globe this Christmas! 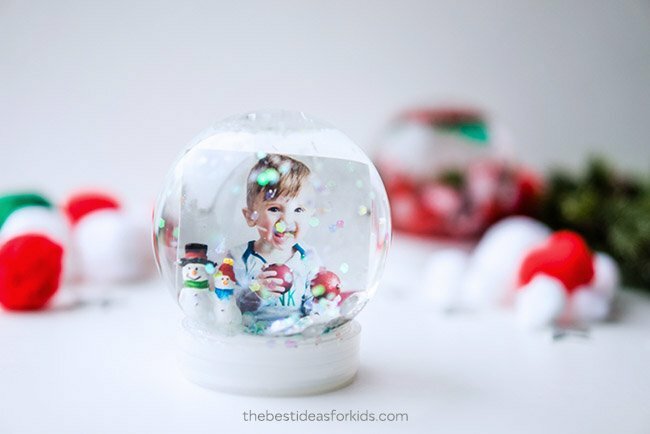 Kids will absolutely love making their own snow globe this Christmas! We had a lot of fun making these for our video show. You can catch the full video tutorial at the bottom of this post. 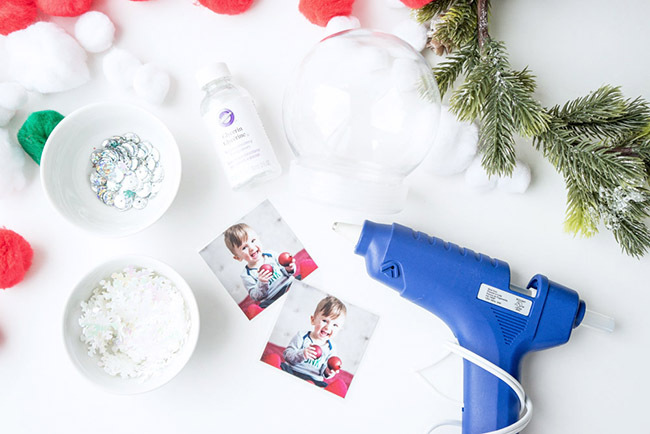 We made some sensory style snow globes also – these are basically just glitter and other kinds of Christmas items that would be fine in water (confetti and pom poms work well). You can see the sensory version in the video at the bottom of this post. 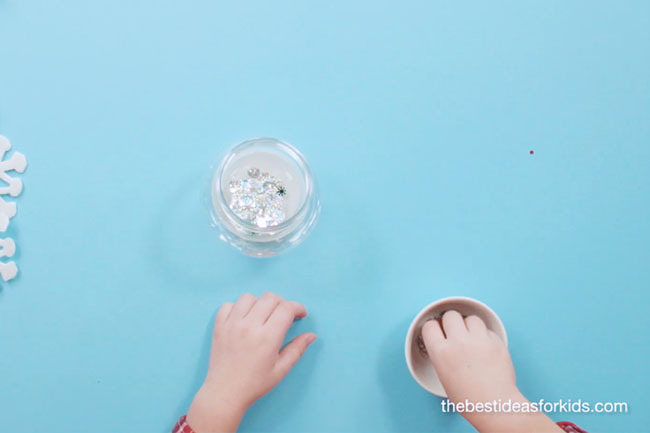 The sensory bottles are great for kids to relax and watch the glitter fall down. They can also shake it up and you don’t have to worry about it breaking because it’s plastic. Our favorite snow globe is the photo version! 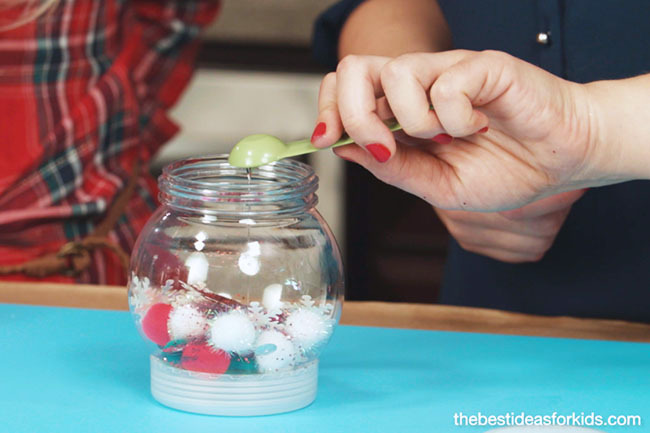 We’ll walk you through the step-by-step instructions for how to make your own diy snow globe. We promise it’s easier than it looks! 1. First, get your plastic snow globe and picture. We got our snow globes from Michaels and they are plastic so they are perfect for making with kids. 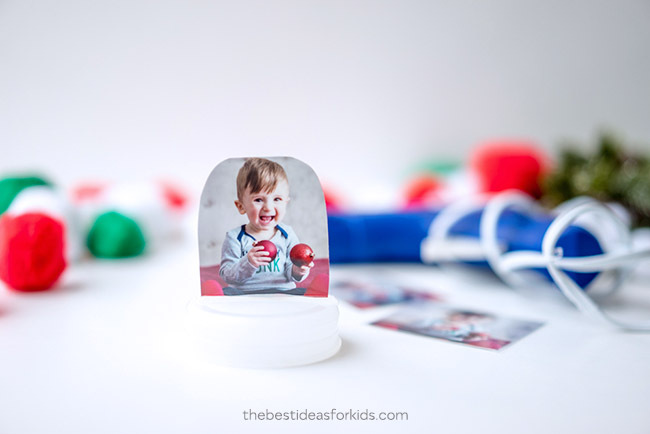 Measure the size of your photo and laminate it. You can get a laminator from Amazon here. 2. 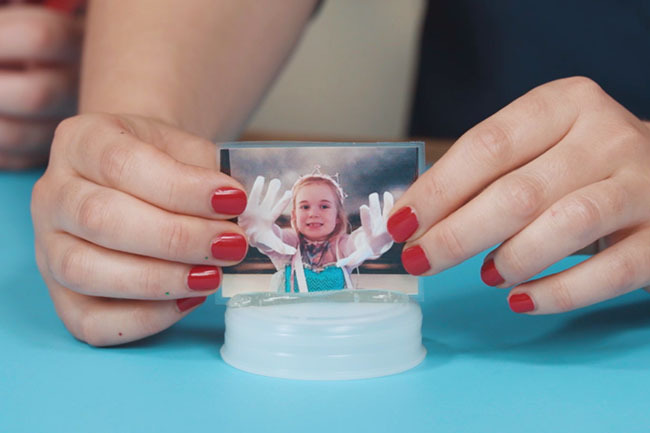 Hot glue your laminated photo to the base of the snow globe. Adults should do this part. 3. Get your supplies together that you’ll want to put inside your snow globe. For the “snow” falling effect, we really like this chunky iridescent glitter. This will give you a snow falling effect but won’t be too opaque like regular glitter which may obstruct your view of the photo. You can also find this at Michaels. We also added in a few small silver sequins and some small snowflake confetti. Don’t add too much glitter and confetti to start. You can always add more after if you feel it is not enough. 4. Add in 1/2 teaspoon of glycerin. This will help the glitter fall a little slower in the water. The glycerin is optional however we do recommend it. 5. Now fill your snow globe with distilled water. You’ll want to leave a little space from the top for the lid and base to go back on. 6. Now add your base back in. 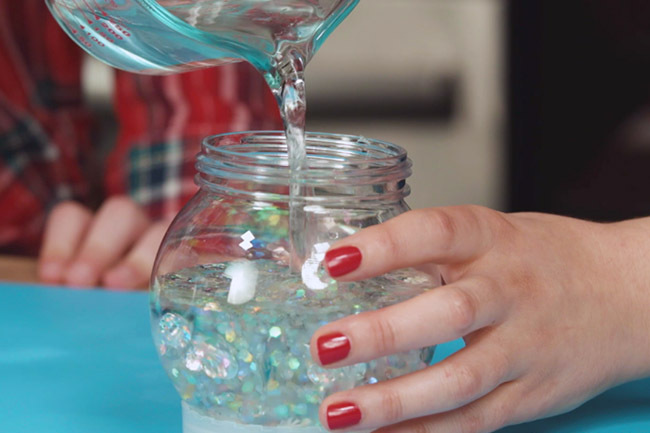 Make sure you allow some time for the hot glue to fully dry before adding into the water. You may need to fold the picture in slightly to fit it back into the snow globe. If you want to keep the snow globe for many years to come we recommend not hot gluing the lid closed so you can top up the water in a few years if needed. However, if you’re letting kids play with it, be sure to supervise them. It is plastic so it won’t break but if the lid loosens you may experience some water leakage. If you want to ensure it won’t leak, you can hot glue the lid on. Just keep it mind you won’t be able to open it later to add more water if needed. 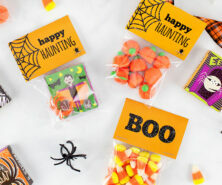 We just love how easy these are to make! We hope you have fun making them! Watch the full tutorial video here before you get started! Also see how we made a Christmas sensory bottle. 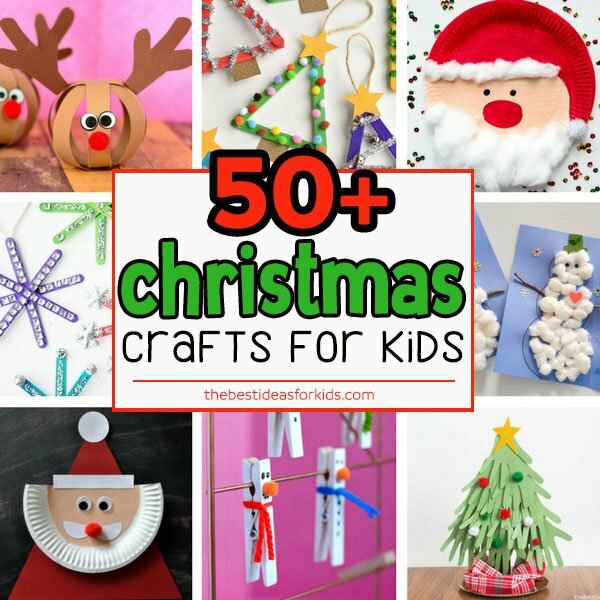 See 50+ Christmas Crafts for Kids – there are so many fun and easy crafts for kids in this list! 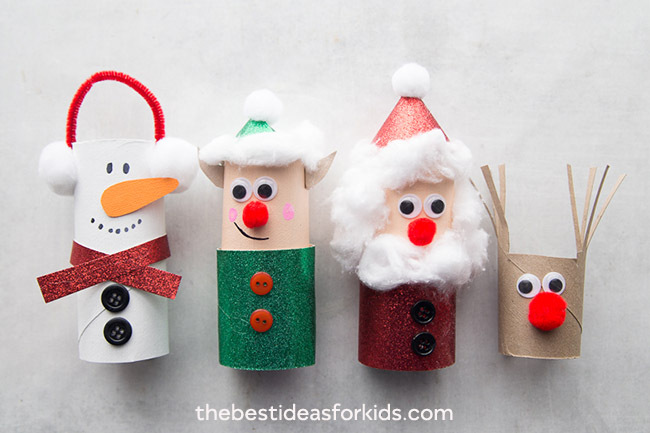 See these adorable Christmas toilet paper roll crafts – an easy and a fun way to recycle paper rolls! 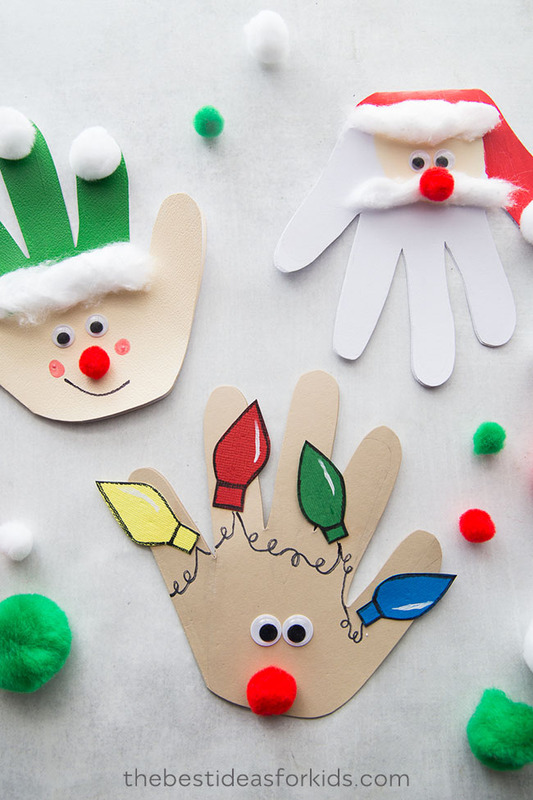 If you’re looking for a Christmas card idea, these Christmas handprint cards are really fun for kids to make! My glitter got stuck to the picture and so the picture is not seen. What can I apply on the photo that the glitter won’t be attracted to the photo? Are you using regular glitter? It should shake off but if you’re having issues, we’d recommend putting less in or using only chunky iridescent glitter. 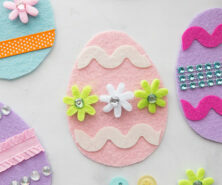 I love all the fun crafts for kids. 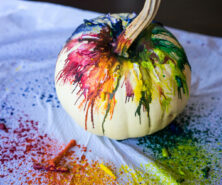 I am always looking for something to have my granddaughters to do when they are with me during the holidays and summer! Love your ideas!